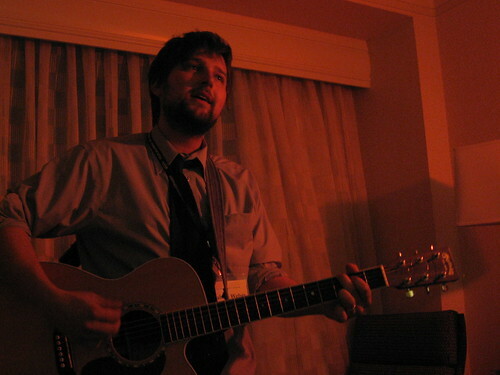 I really want to share a video with you to help you fully understand and embrace the classic American songwriting style and unencumbered delivery of songwriter Graham Weber, one of many young up-and-coming folk artists whose presence at Folk Alliance 2008 is everywhere. However, the obviously purposefully overpriced and spotty internet service at the Downtown Marriott (along with the cold water in the bathroom sinks and other cost-cutting signs of Marriott’s unhinged corporate greed which are not the fault of the Folk Alliance) prevent me from sharing. For now, check out this song from Weber’s newest album, The Door To The Morning. Graham Weber will be appearing tonight at Otherlands in Memphis as part of a stellar lineup including Cory Branan, Colin Gilmore, and John August. Showtime is 7:00pm. Click here for more details.